Let us show you around our home. So you are thinking of joining us for three months, five months, or more. Now you are curious about where you could live. Let’s start with a short video to give you a campus tour and show you around a bit. Get a glimpse of where we study, eat, sleep, and hangout. We want the classrooms to be places where students may grow intellectually and spiritually. To facilitate this growth we aim to create an environment in the classrooms that will be comfortable and personalized to each school. The classroom is a primary place to build relationships with your fellow students and leaders who are also seeking a deeper relationship with God. We love coffee! At Cafe Des Alpes we have coffee and tea served hot and cold. We also have snacks that vary from chocolates, muffins, croissants, Korean noodles, and ice cream along with many other options for your daily break from the classroom or work. Cafe Des Alps is a laid-back environment where you can hang out with your friends and play games over a nice latte or use the computers we have available to staff and students. YWAM Lausanne is a place to meet new friends with whom you can grow and learn. Many of these friends will also be your roommates. The Chalet is where most of our bedrooms are located. Roommates are great people to do life with, whether that is praying together, swapping stories, or learning more about each other’s culture and personalities. The dining room is where we come together as a big family and enjoy meals together three times a day. Some of the best conversations happen here, as we pause from our other activities and listen to one another over a tasty meal. Canaan is a three-story house where many of our staff reside. The building also includes some gathering space, and it is a great place to watch the snowflakes fall in the wintertime. Equipped with a couple of cardio machines and weights, the gym helps us to stay in shape. So take the opportunity to pump some iron or run on the treadmill while you are here. 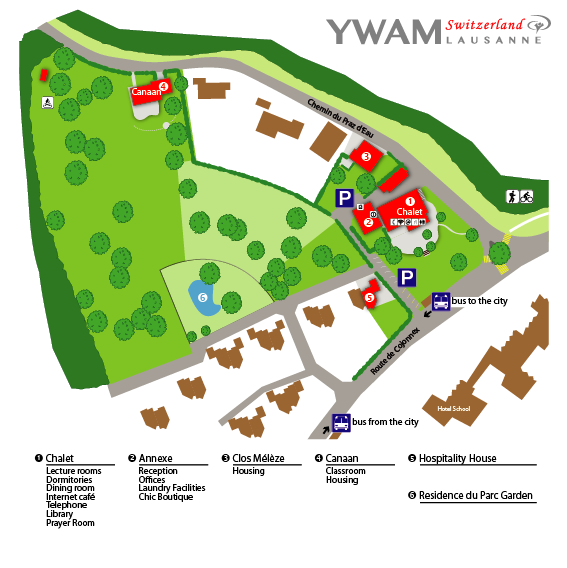 Surrounded by mountains and alongside a large forest crisscrossed by hiking trails, the YWAM Lausanne campus dates back to 1969, when YWAM Founders Loren and Darlene Cunningham opened YWAM’s first training location. Through the years, we have expanded our campus as God opened the doors for more growth. Most of our student housing and classroom space resides within the Chalet, but we also have buildings that house our staff, guests, and offices. Inside the Chalet is also where we meet for our community worship and prayer times. Depending on the weather, we love to gather in the field for a bonfire or game of frisbee. The bus stop at the front of our campus offers easy access to the city of Lausanne and connects with other public transport systems to allow you to explore Switzerland. At the heart of a great campus is great people. Life at YWAM Lausanne is lived in community. We live and learn together, serving alongside people from different denominations, cultures, and backgrounds. The diversity found within our community is a beautiful expression of our multifaceted God. As the YWAM Lausanne family, we seek to encourage and support one another so we can overcome life’s challenges and follow Jesus side by side. Being a disciple of Jesus is more than just words, it’s a lifestyle. So whether we clean dishes or sing praises to Jesus’ name, we seek to do so in a way that glorifies God. "I enjoy the family atmosphere at YWAM Lausanne, and how it's easy to connect with many different cultures in a group setting and on an individual basis." "For me, the best thing about living here is I can make friends from all over the world. It helps me understand other cultures and embrace them in God's way." "I love all the opportunities to grow closer to people. Even doing my practical ministry or being in the cafe, I can talk to people and get to know them; I love the closeness of the community." We have many different opportunities for you to come and train with us. Click the link below to find out more.